For Ellen follows Joby Taylor an itinerant rock star lost in a snowbound small town America. He’s there to sign divorce papers with his estranged wife but signing will also mean forfeiting all custody of his six year old daughter Ellen – and there’s the rub. 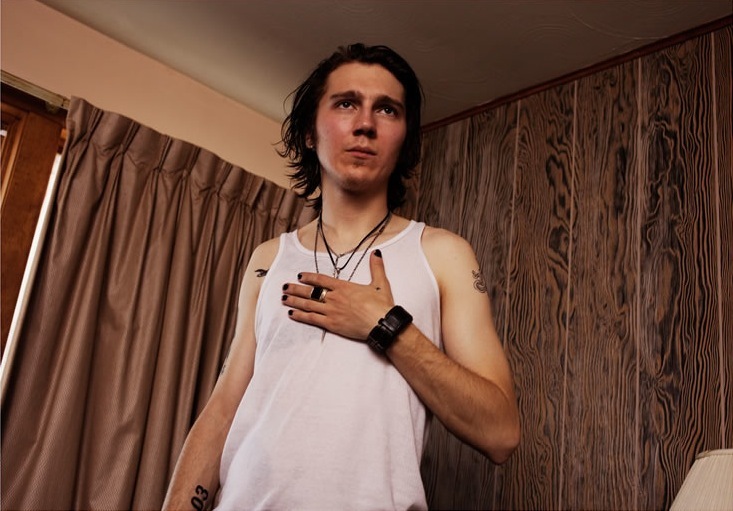 In the role of Joby is Paul Dano and this film belongs to him. With his skinny jeans and leather jacket he is ill suited to these frosty conditions. We see him slip around like a puppy learning to walk. Joby tries to find his feet and get his head around a situation that he has long ignored. He’s palpably scared of the responsibility of fatherhood but also drawn to it. This is a character study clearly influenced by 1970s cinema and in particular Bob Rafelson’s Five Easy Pieces. There we observed Jack Nicholson’s Robert Dupea – another talented man adrift, forced to confront a family he feels isolated from but determined to remain unknowable. Writer/director SoYong Kim hones in on Joby using a shallow depth of field to isolate him and letting shots linger as if to allow us a chance to work him out. In sharp contrast to Joby is his solicitor Fred Butler. We witness the suffocating comfort of Fred’s domestic life with his mum and he seems to be the polar opposite of Joby: all thick jumper and sensible hair. But Jon Heder’s subtle performance conveys a man equally at sea. You feel there is more to explore here but the film (like Joby) shies away from relationships. There is a refreshing honesty in the way SoYong Kim embraces awkward reality but at times you yearn for stronger interactions to lift Joby from his stupor. Despite this For Ellen has a real feel for atmosphere and while Joby may slip from our grasp there is no doubt that Dano and Kim are worth keeping track of.